← Do You Have a DCOI Compliance Strategy? Cloud computing, in one form or another, is here and it is not going anywhere. It is for a good many reasons – it provides easy scalability, is less expensive than expanding infrastructure to add storage, is less expensive to maintain because it does require additional power and cooling, makes project deployment easier and quicker, and is easy to create redundancy and reliability. While these benefits are significant, they are just the surface of the advantages of utilizing the cloud but there is debate over what type of cloud is best – public, private or hybrid. Private cloud is essentially an internal, enterprise cloud that is privately managed and maintained. The data center is responsible for hosting the private cloud within its own intranet and is protected by the data center’s firewall. The private cloud provides all of the efficiency, agility, and scalability but also provides better control and security. This is a great option for a data center that already has a robust infrastructure and enterprise set up, but it does demand more than the public cloud. If a data center employs the private cloud, all management, maintenance and security falls squarely on the data center’s personnel. One of the distinct advantages of the private cloud is how much control you have over how it works for your unique needs. Private clouds can be configured to meet your needs, rather than you configuring your applications and infrastructure to meet the needs of the public cloud. Many data centers have legacy applications that cannot always adapt well to the needs of the public cloud, but with the customizability of the private cloud, a data center can easily adapt the private cloud to meet the needs of the enterprise. The level of security provided by utilizing the private cloud may be particularly important for those enterprises involved in healthcare or banking/finance because of the strict regulations and requirements placed on security and privacy. If you possess and work with data that is restricted by security and privacy mandates like HIPAA, Sarbanes Oxley, or PCI, you cannot use the public cloud to secure your data. For such highly-sensitive information, you are required to store your data on the private cloud to remain compliant or else face high penalties. 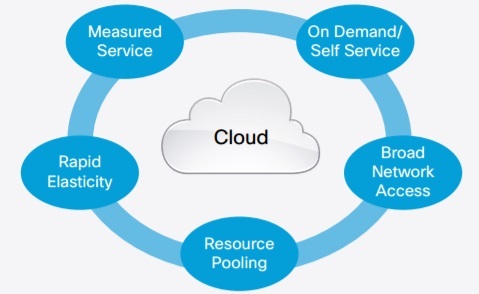 The public cloud also provides the fundamental benefits of cloud computing, as well as its own advantages, but offers less control over maintenance, management and security. Some enterprises may see the requirement of less management and maintenance as an advantage because they simply do not have the resources or personnel to manage the cloud themselves. By opting for the public cloud, your data is stored in a data center and that data center is responsible for the management and maintenance of the cloud data. For enterprises that do not have extremely sensitive data, the trade-off of security and control for less management and maintenance may be completely acceptable. While you do not have as much control of management and security, data does remain separate from other enterprises in the cloud. The public cloud does save on hardware and maintenance costs that would typically be incurred by your business. You pay for the public cloud to use storage capacity and processor power so that you do not have to manage or pay for that capacity or power on your own. Because you are paying for a service, it is easy to scale up or down quickly without much preparation or change on your end. The public cloud often functions on a “pay-per-use” model so you can quickly make changes, scaling up or down in literally a matter of minutes. For small businesses that do not work with highly sensitive data, the public cloud may be ideal. But ultimately, it all comes down to how much control you need over the management and security of your data. It is important to not forget that there is actually a third option – the hybrid cloud. The hybrid cloud is a blend of both private and public cloud, offering enterprises a solution that may provide the best of both worlds. With the use of the hybrid cloud, enterprises can leverage the advantages of both the private and public cloud in partial ways that best suit the needs and resources of the enterprise. By doing this, all sensitive data can be managed with the private cloud and the private cloud can be customized the suit any less-flexible applications. Likewise, the public cloud can be used for information that is not as sensitive or governed by privacy and security mandates, and can also be used for on-demand scalability. Hybrid cloud is a mix and match solution of the best elements of both private and public clouds for those enterprises with diverse needs. This diversity is what will help many enterprises evolve and be flexible as IT innovations emerge. What is interesting about a hybrid cloud solution is that it serves both large and small organizations well because of it offers flexibility, scalability, and security on an as-needed basis. It allows organizations to slowly “dip their toes” in the public cloud pool while maintain control over sensitive data, via the private cloud, that they are not yet ready to put in the public cloud. RightScale’s survey of cloud computing trends for 2016 notes that hybrid cloud usage is on the rise, “In the twelve months since the last State of the Cloud Survey, we’ve seen strong growth in hybrid cloud adoption as public cloud users added private cloud resource pools. 77 percent of respondents are now adopting private cloud up from 63 percent last year. 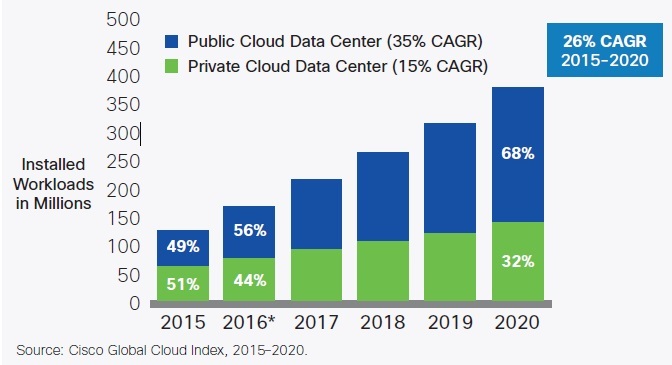 As a result, use of hybrid cloud environments has grown to 71 percent. In total, 95 percent of respondents are now using cloud up from 93 percent in 2015.” Additionally, the hybrid cloud may be a very cost-effective solution, allowing enterprises to assign available resources to private cloud needs without having to retain vast additional resources that might be necessary if only using private cloud. How enterprises use the cloud will depend heavily on resources, security and control needs, privacy restrictions, and scalability needs. If you are struggling to decide what the right fit is for your enterprise, consider carefully what applications you intend to move to the cloud, how you currently use those applications, any regulatory concerns, scalability needs and your ability to adequately manage whatever your choice ultimately is. If you have the infrastructure and resources to manage your cloud well, as well as security concerns, the private cloud may be the best option for your needs. However, if you are a smaller organization with lower security concerns, offloading management responsibility by utilizing the public cloud may relieve a lot of the strain that a private cloud might place. Whether using public cloud, private cloud or a hybrid of the two, one thing is certain – almost everyone is using the cloud. And, if they are not yet, they will likely be using it soon. This entry was posted in Cloud Computing, data center equipment, Data Center Infrastructure Management, Data Center Security and tagged data center equipment, data center security, hybrid cloud, private cloud, public cloud. Bookmark the permalink.